Well, this past weekend was the Nautica-not-Nautica South Beach Triathlon (or, this year: the South Beach Triathlon). I attempted it last year and failed spectacularly. Yeah, yeah, I got further than other people who didn’t even attempt it, blah, blah, blah. This year, when I signed up, I was determined to finish it. Then I hurt my knee and lost two months of training. Oh well, my new plan was: do the swim, and if I feel good then do the bike, and if I still feel good then do the run. This was a great way to look at it because I took the pressure off myself. I gave myself permission to quit. Though I knew if I started, come high or hellish water or ambulance, I’d finish. The week leading up to the race was the usual mental breakdown. I was loading the car the day before and decided to take my bike for a little spin. I had just ridden (rode?) 4 days before so I didn’t expect much to be wrong. BIG MISTAKE. The chain was rusted and seized. Oh crap. Luckily, my good friends at WeCycle (www.wecyclekw.com) were able to replace the chain on my way out of town the next morning. So my stressed self and good friend Gabby headed to Miami. Which does little to relieve stress. Seriously, do they drive blindfolded up there? We got to Miami with little incident and checked into the hotel which was right across from the street from the start/finish/transition area. Best money ever spent. I could just valet my car and not worry about it til we left. And could sleep in the next morning (well, if you can call 4:45 sleeping in). I went over to packet pickup and the expo and was immediately rendered speechless and terrified and excited all at once. I was unable to eat much dinner (or lunch earlier) and was back at the hotel and in bed around 9:30. I woke up at 4:45 and jumped out of bed ready to conquer South Beach! kidding. I woke up exhausted and nauseated. Yaaay nervous stomach! I got dressed, stared into space for a LONG time and then started to pump up my tires. I was having some trouble so asked Gabby to help by holding the pump tight to the valve. And then “snap”. The tip of the valve broke the F off! just broke!!! Instant panic. I called Colleen and she said to stop panicking to come over to transition and City Bikes was there to fix it. And they were! And they did it super fast! Hooray. I guess. I mean, if they couldn’t fix it, I couldn’t race. Not gonna lie, I was a bit disappointed it was such an easy fix lol. Oh well. I finished getting my stuff together, met up with the rest of the Key West contingent and headed off to the swim start. Now, for those of you that don’t know how it works, there is an International Distance and a Classic Distance (like a Sprint! but stupidly “how come I just didn’t do the International” longer than a Sprint). The International goes first and then the Classic. And there are 3000 people in this particular triathlon, so it starts early and they send people into the water by division and age group at timed intervals. Transition closed at 6:45. Everyone had to be out and you didn’t have access to it again until you finished the swim. So if you forgot something, you’re kind of screwed. The reason for this is that before most of us Sprinters even got in the water, a lot of the International folks were done swimming (aholes) and you can’t have random people just wandering around in transition. Because of all the people and because of my age and division (Athena. i.e. “fattys”), I was one of the very last waves in the water. I wasn’t scheduled to start until 8:16. So that was about 90 mins to kill from when transition closed until I started. That was a TON of time to hydrate, eat, throw up, hydrate, eat, throw up and repeat. The closer it got to the start though, the less nervous I became. It was very strange indeed. Finally my group was called to lineup and off I went. The beauty of my age group/division is that we know we’re not the best so we usually end up chatting while we’re waiting. I was lined up with a poor woman who was absolutely terrified to swim. In giving her a pep talk, I got excited to race and forgot about how I wasn’t as ready to do this race as I’d like. We got the go and off we went! the water was rough but warm. once around the first buoy, it was a straight shot parallel to the beach then around one more buoy and in for a 1/2 mile total swim. It was so rough and shallow straight out to the first buoy that most of us opted to just walk out to it. Not very Tri cool, but whatevs. Then the real work began. I felt like every time I got into a good rhythm, a giant wave would crash over me when I tried to take a breath. The first thing they teach you when learning to swim is NOT to breathe the water in. Makes breathing and then swimming WAY tougher. I sort of coughed and choked my way to the swim out and was not only not last, but about 2 1/2 minutes faster than last year. Yaay! well, that elation was short lived as it was flipping FAR to the transition area. I was hoping there was a shuttle but no such luck. After my usual awkward, clumsy transition, I was off to hike my bike to the other end of transition somewhere around Ft Lauderdale. I got on my bike and off I went. The bike went pretty well overall. It was billed at 20.7 miles (can’t we just call it 21?). It wasn’t easy certainly, but I was pretty pleased to just complete it. It had ginormous steep bridges and a ton of wind. On the way back, it seemed like no matter what turn I took, I was upwind. I had good moments and bad. The worst was struggling upwind up a bridge, barely making forward momentum hoping I’d be a victim of one of those drive by shootings that Miami is famous for. The last 2.5 miles I just had to tell myself “almost there, it’s just like biking from my house to the Conch Farm”. and then I had that “if I can’t get off of this bike soon, I’m going to DIE” But mostly I was just damn impressed with myself. Before the turnaround, an older gentleman came up alongside and decided to strike up a conversation. Once I got over the “wtf? are you kidding me? Why are you talking to me?”, I was glad he was there. His name was Nathan and he was celebrating his 72nd birthday by doing his first Triathlon. What?? HELL YEAH! we rode together on the straight aways and then lost each other on the bridges and met up again in transition. I was absolutely STOKED when I got off my bike. I really couldn’t believe that I had done it! cue the tears. My race strategy is apparently to rid myself of all liquids and food at all times. Just the 4 mile run was next. I knew at the very least that I could walk it. Nathan and I struck out on the walk. I ate a granola bar, drank some water and listened to his fascinating life story. My lower back was totally cramped up at that point and running was out of the question. We walked to the turnaround and Nathan decided he was going to try to run the whole 2nd half. We wished each other well and I was on my own. At this point is was about 11:15 and I had been on the course for about 3 hours. Yup. 3 hours for a shorter distance Tri and I still had 2 more miles to go. Cause this is a “classic” so instead of a 5k, it was a 4 mile run. joy. My back had loosened up enough where I thought that I could run. So I walked/ran for a bit. At this point the temp was probably about 1000 degrees (or, like 83) and there was absolutely no shade. I started the race with a nutrition deficit due to my stupid nervous stomach and the bike was so tough that I didn’t eat enough as I was just trying to pedal. Mile 2 is where this all reared it’s ugly head. I ended up getting sick 3 times. It was run, vomit, walk, repeat. Lovely for all the South Beach patrons to witness. You can probably find me in the tourism guide. All I knew is that if I ran, I’d get to the finish faster and it’d all be over. And then I got to Mile 3. Those sick, sick race organizers saved the worst for last. it was about a 1/4 mile on hard sand and then the last 3/4 mile or so was on the beach. ON SAND. IN FULL SUN. Are you F’n kidding me???? And when I got on the beach, I could see the turnaround waaaaaaayyyy in the distance. oh crap. I just put my head down and kept moving forward. I got to the turn around and YAAAY!!! and then D’oh! I still have what seemed like FOREVER to go to the finish. But soon enough (not), the finish chute came into view and I started to cry. I was so happy that I finished! I was actually proud of myself for the first race ever. I raised my arms up for the photographer, got my medal and immediately almost passed out lol. Another racer came running over, got me the cold towel for my head and poured wonderfully cold water down my back. I stumbled to the food tent, grabbed a banana and some water and tried to steady myself. I’d like to say that I stopped and took it all in but due to my late finish (4 f-ing hours. I have yet to say my time without adding the “f-ing”), I had like 10 mins to get my stuff out of transition. At that point I was severely dehydrated, dizzy, overheated and not entirely certain that I wouldn’t see the medical tent. Gabby helped me with my stuff and we went back to the hotel. It took my a good hour of sitting on the floor in my disgusting Tri kit eating and drinking before I felt like I wouldn’t pass out in the shower. and it was the best shower ever! So there you have it. I was ill prepared and did it anyway and finished it. That was really all I had hoped for. And now I never have to do that damn race again!!! I wonder when 2015 registration opens? 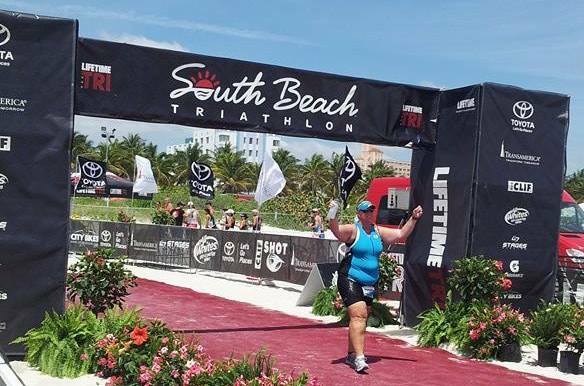 This entry was posted in Uncategorized and tagged #lifetimetri, #sobetri. Bookmark the permalink. I had nerves of excitement the whole time I was reading. I AM SO PROUD OF YOU ! Comming up on the anniversary of the boston marathon bombing I am inspired by stories of courage and determination both of which you poses. You are definitely BOSTON STRONG ! Sassy! Thank you so much. Made me cry, for real! i remember when you came down to the dock to calm me down before my first one. Love you to bits and miss you tons! You are AMAZING! Oh and very funny too.